NOTE: The terrible pun in this title only works if you pronounce it mine-o-tar. Which is the more fun way to pronounce it anyway! 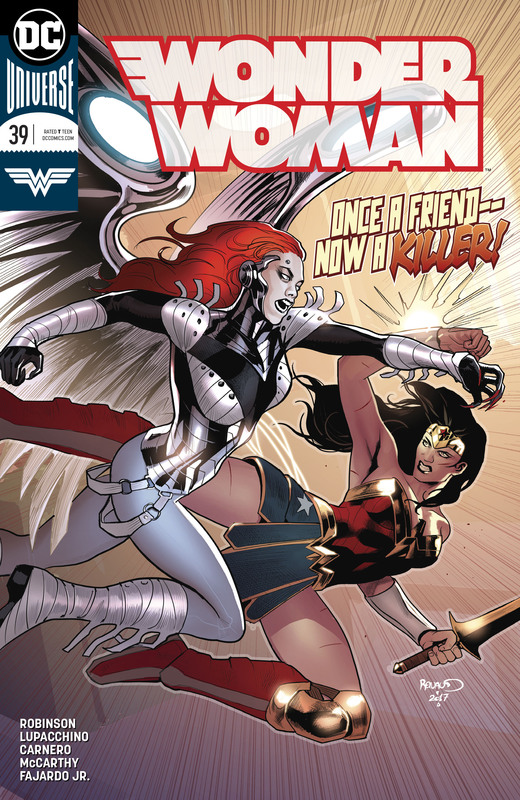 After several issues of serious goings on in Durovnia, with Diana facing off against the god of war himself in the midst of a complicated international conflict, this week’s Wonder Woman brings us some much lighter fare. Cadmus the pegasus, Damon the satyr, and Eirene the minotaur were introduced earlier in the run, exiles from Themyscira who found themselves in Durovnia with no recollection of how they got there. Now, with the war sorted and all mythological persons ordered out of Durovnia, Wonder Woman has brought them to stay in America while she looks into the mystery surrounding their initial arrival. I am about to reveal what happens in this issue! Turn away if you haven’t read it yet! Also, it’s got a pegasus, a satyr, and a minotaur exploring Washington, DC! It’s an issue worth picking up! I’m glad to see G. Willow Wilson’s shift in tone with this issue. Not that the first few issues were too serious, but we’ve seen writers in the past come in and be ONLY serious, forgetting to bring some levity and fun to the proceedings. I was confident that Wilson would be able to strike a good balance, and she definitely shows that here. While it’s a romp of an outing, it still fits well with everything she’s done before. Setting up the characters early on was wise, as they provided brief moments of comic relief amid the war, and now they have some room to breathe as they get up to some hijinks in the nation’s capital. Not that the past is forgotten, though. The mystery of how Cadmus, Damon, and Eirene came to our world hangs over the entire issue, presumably setting up Wonder Woman’s pursuit of answers and a potential return to Themyscira in the weeks to come. Plus we got a teaser of an ending that suggests all of this will be much more complicated than we thought. I’d be curious to know how this issue came together because, as I said above, the cover suggests a much more serious tone. This could have been an exploration of the many, many problems with the American immigration system and xenophobia throughout the country, and we got a bit of that. The border protection agent was talking about a special registry, diners were displeased at their presence, and Damon pointed out the ease with which Diana could assimilate in America because of her appearance and how it was difficult for them because they looked so different. But ultimately, it felt like Wilson pulled away from leaning into that metaphor too much in favour of a funnier outing. These hints of a critique never developed into anything substantial. Instead, we got whacky fun, and ultimately some new friends for our displaced creatures. And, Ferdinand the minotaur, back again! Perhaps finding romance, even? You can’t beat that. As much as I love some social commentary in my Wonder Woman comics, I think that Wilson chose the right tack with this one. And editorial brought in the right artist. We haven’t seen Cary Nord for a while, and instead of Xermanico again we’ve got our old pal Emanuela Lupacchino. She’s been a go-to artist on several runs of the book now, and she always does a marvelous job of it. Lupacchino has a knack for Wonder Woman herself, and draws her in a way that captures both her power and beauty every time she gets a crack at the character. And apparently, she’s excellent at mythological creatures as well. She brought great humour and expression to the gang, setting the tone for the book from the get-go. Her art was just this side of cartoonish enough to keep everything grounded, but close enough to cartoonish to make it all extra funny. It was a fine line, and she walked it well. Her linework paired wonderfully with Romulo Fajardo Jr.’s colours as well. After so many issues together, he clearly knows how to bring the best out of her style of art. We’ve got to talk about that ending, though! First off, Veronica Cale is back and I am here for it. Greg Rucka did a fantastic job with the character when he relaunched the book, making her both sympathetic and still very much a villain, and I trust that Wilson will continue in that vein. She’s going to present a big problem for Wonder Woman because it turns out that she has Nemesis chained up in her basement. Now the question is, which Nemesis? You may remember a couple different versions of Nemesis from past comics, including Tom Tresser in Gail Simone’s Wonder Woman run or Soseh Mykros from JSA years and years ago. But I think this could be the Nemesis from Greek mythology, the goddess of retribution who strikes down those with the hubris to defy or disrespect the gods. In which case, yikes. This is a very powerful deity, and one that could be a lot of trouble for Wonder Woman if Veronica Cale’s got any sort of hold over her. I’m curious to see where this goes, and if Cale had a role in the return of the gods. If memory serves, her daughter is trapped in Themyscira right now. She has the motive to tear down the veil between the two worlds, that’s for sure. So this week we got some fun frolics and some ominous developments, and I can’t wait for what comes next. More gods, more mythological creatures, more Amazons maybe? Time will tell. Whatever is coming, it looks like Wonder Woman is going to have her hands full. I know I usually go with the main cover to start my review, but this Jenny Frison variant cover was too amazing to ignore. Look at that! It’s so creepy and menacing and gorgeous. 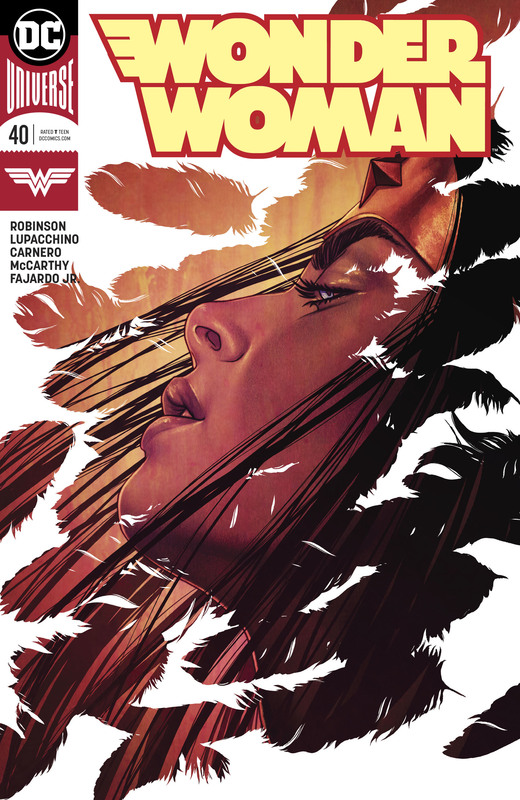 While Frison has done consistently fantastic work with her Wonder Woman variants, this is one especially excellent. And perfectly spooky! I’m not going to tell you what happens on the last page in the first paragraph of my review! Read on only if you’ve read the entire issue! Which you should do, because this is a fun crossover! So let’s backtrack a little bit. 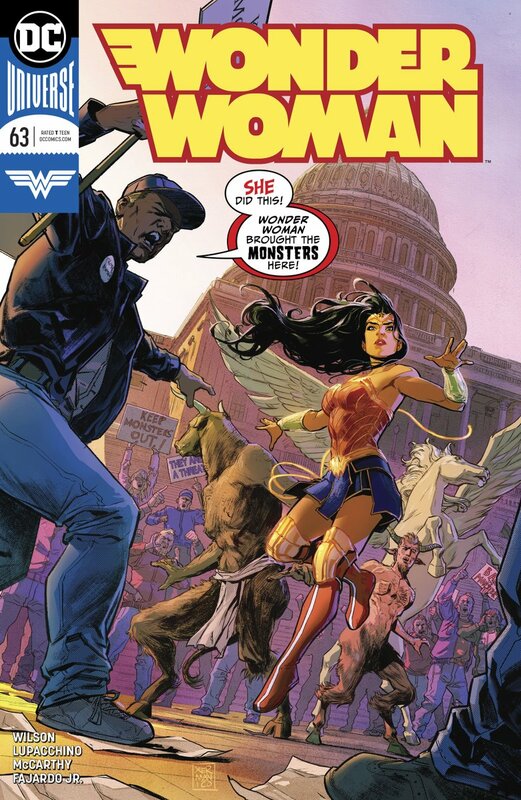 The issue opens with Wonder Woman on the moon, except not really. For our ancient ancestors, the moon was the first mystery and they saw a sort of magic in it. Hecate, as the goddess thereof, thus adopted this magical concept of the moon as her domain, what Witchfire calls “the primal dominion of magic.” Her power exists not on the real moon, but within the metaphor of what the moon represents. It’s all super weird, and I love it. First off, waking up with a shock is a bit of a trope, sure, but one that can be a lot of fun when handled well. And in a spooky story like “The Witching Hour,” the surprise wake up was an excellent choice, especially since when we last left Diana she was fully possessed by Hecate and straight up destroying Nanda Parbat. Second, to have her wake up on the moon is enjoyably unexpected. And third, then everything gets all tricky, what with her being trapped on a metaphor of the moon and all, and I was so into it. This is a big crossover with all sorts of characters and locations, and this moon section, while important, will only be a small part of the overall story. It could have been simpler. Vaguer. Easier. But James Tynion IV took the time to make it unique, to come up with a big, interesting idea to make the scene extra cool. You gotta respect that level of commitment to telling a fun story. Everything about this opening was delightful, the art especially. Emanuela Lupacchino always does excellent work, but I tend to focus on her lovely female characters. While she’s still slaying on that front here, she also does a gorgeous job with the lunar landscape, making it feel like the moon but not quite the moon. It looks like a metaphor for a magical representation of the moon, basically, which I’m guessing was very hard to pull off. And Romulo Fajardo Jr. colours it beautifully. It’s a pale, silvery world but it never feels flat, and Wonder Woman’s pop of colour is just enough of a contrast to stand out without being garish or out of place. The whole sequence is gorgeous. And the issue stayed strong from then on. While it wasn’t as action packed as last week’s, it had some good moments for everyone, a few payoffs and twists on past events in the crossover, and some major developments. In terms of character growth, we learn that Constantine is gravely ill and, with magic not working correctly, beyond help. If this doesn’t get sorted in the finale next week, I’m guessing this will play out in future issues of Justice League Dark. On the story side of things, we have the exorcism. I came into this issue having no idea how the team was going to deal with a possessed Wonder Woman, and dang if this isn’t an enjoyably elegant solution. Of course they try an exorcism! They’ve got John friggin’ Constantine. Why wouldn’t they? It’s played wonderfully as well, with neither Constantine nor Zatanna terribly confident it will work but yet keen to try it nonetheless because they have literally no other options at this point. Of course, it all takes a terrible turn. Black Orchid and Manitou Dawn are freed from Hecate’s control, but Constantine miscalculated things and all of their power races into Diana. It’s a lot of power. Too much power, it seems, because the issue ends with Witchfire telling Diana that she has died. Now, I’m going to go out on a limb here and say that I don’t think that Wonder Woman is dead. DC’s got G. Willow Wilson and Cary Nord coming on in a couple weeks in what is a pretty big deal for the publisher. I’m quite confident that Wonder Woman is going to survive this crossover. But that doesn’t mean she isn’t in a pickle right now. If she is dead, they’re gonna have to bring her back, and if she isn’t then she’s certainly not in a good way. Whatever is going on, it’s going to need sorting in the finale next week. Diana’s still trapped in the lunar metaphor, and I presume the wrath of Hecate is going to be swift and violent. Nothing’s coming easy for the team in this run, and I’m excited to see what hare-brained scheme they come up with next week in the crossover’s grand finale. 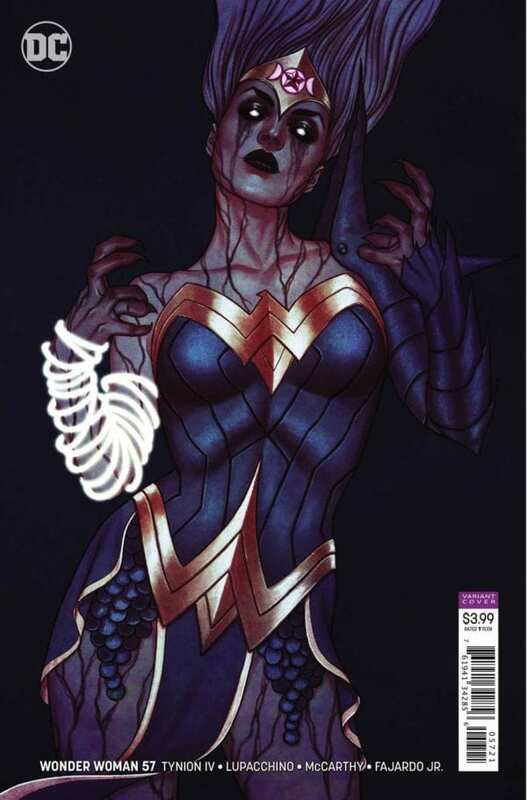 Wonder Woman #56 Review: The Witching Hour Continues! Also, you should buy this issue! And the other parts of the crossover! I’m going to start by talking about a small, almost inconsequential part of the book, but it’s something done smoothly and well in a way that deserves recognition. Continuity is in a tricky spot right now in the DC universe. The New 52 relaunch was rocky, and the “Rebirth” books did some good course correction but confusion still remains. This is true most of all for Wonder Woman. Her continuity right now is a dang mess. Elements I thought were changed and sorted keep coming back, and parts of her past remain massive questions marks. It’s chaos. But sometimes, there’s a simple fix to a problem. Case in point: Circe. In the New 52 era, she appeared in the deservedly maligned Superman/Wonder Woman series in classic scary witch form, wreaking all sorts of havoc. But in the “Rebirth” era, Bilquis Evely did a marvelous redesign of the character that modernized her for Greg Rucka’s more nuanced take. These contrary incarnations both exist in the same universe, so Tynion found an easy workaround. He brought out the first Circe, all pigtailed and black bodiced, to intimidate Wonder Woman and her friends, then when she realized what was happening she morphed into the newer, chiller Circe, explaining that the first look was just for theatrics. It’s an elegant way to clean up a continuity snafu, all while adding a little drama and humour to the story. Speaking of humour, I really enjoyed the balance of the serious and the silly in this issue. Terrible things are happening for Wonder Woman and the gang, with our Amazon heroine plagued with a powerful curse and Hecate set to destroy all magic, violently and brutally. It’s a bad scene. But the book doesn’t languish in tense planning and argument. There’s a lot of that, sure. Wonder Woman’s got kind of a whacky plan here. But there are enough small, humorous moments to keep everything from feeling too heavy. Detective Chimp is always great comic relief, and it turns out Man-Bat is a good source for some unexpected laughs too. The tone is well managed throughout, maintaining the tension while not drowning in it. Tynion’s done a nice job crafting an impossible situation, too. Wonder Woman and Zatanna’s argument over what to do in the face of the overwhelmingly powerful Hecate was so well done. It’s hard to craft an argument where both sides have totally valid points, but while reading this I kept flip flopping back and forth over whose side I was on. Diana wants to wield Hecate’s power with Circe’s help, tapping into it without being controlled by it. Zatanna thinks that channeling the power would be impossible and that Wonder Woman would slip under Hecate’s control again. And they’re both right! There’s no other power strong enough to challenge Hecate but her own, but it’s also a power that Hecate can control. It could work, but it could also go terribly awry. It’s also an argument that doesn’t get personal. This isn’t about trust. Zatanna doesn’t think that Diana is weak and Diana doesn’t think that Zatanna is cowardly. They’re facing an awesome power, and they just have different ideas and concerns. In the end, Wonder Woman goes for it, of course. We’ve been seeing a lot of stories lately about Wonder Woman going above and beyond, taking on the weight of the world because she’s confident she can bear it. It’s a compelling theme, and one that’s especially apt in today’s political climate. And the fact remains that everyone has limits. There’s no one I would rather have try to wield Hecate’s power than Diana, but at the same time, that power is immense. Even Diana might not be able to keep control of it. Watching this all play out has made for great reading thus far, and I’m excited to see where it goes from here now that she’s taken this next step. As I mentioned at the top, Emanuela Lupacchino drew this issue, with inks from Ray McCarthy, and I am always glad to have her in the pages of Wonder Woman. She’s got such an ease with the character, capturing her power and beauty with aplomb in every panel. It was fun to see her draw some other DC mainstays as well. Lupacchino’s got a knack for female characters, so Zatanna and Circe were super cool, but the rest of the gang were nicely done as well. She captured the growing tension of the issue, while also nailing the smaller comedic moments. And she was joined by colorist Romulo Fajardo Jr., who always brings the heat. I know I go on and on about him all the time, but seriously, flip through this comic book. Look at the textures and the colour choices and see how everything beautifully compliments the line art. The dude is so good. “The Witching Hour” continues next week in Justice League Dark, so be sure to let your local comic book shop know you’re on board for the entire crossover. These first two issues have been really good, and I think the whole event will be worth picking up. It’s spooky and enjoyable and I honestly have no idea how they’re going to win this one, which is the sign of an excellent story. Wonder Woman #44 Review: The Fight Rages On! And Remains Terrible/Nigh Unreadable! I had a really nice weekend, gang. I went to Chicago for C2E2, had a great time at the show, tried a poke bowl for the first time (it was DELICIOUS). It was excellent all around, and the fun started with a panel discussion about Catwoman at The Book Cellar with some super smart comic critics. Angelica Jade Bastien, Lauren Burke, Caitlin Rosberg, Katie Schenkel, and I spent the bulk of the time discussing Catwoman, of course, but every now and again the conversation would turn to the current run of Wonder Woman. And with that turn came utter bewilderment at what a mess the book is right now, partly in relation to its brilliant “Rebirth” relaunch and partly just on its own, entirely lacking merits. Everyone was utterly flabbergasted at the horrible depths the series has sunk to as of late. It was a cathartic conversation, with the general consensus being that James Robinson should perhaps consider a different career path entirely. I am about to reveal the secrets of yet another painfully subpar issue of Wonder Woman! They don’t make a lick of sense in terms of current continuity, though! So this issue is mostly fighting, which I appreciated. The brawling meant that there weren’t long, drawn out conversations that lacked any semblance to normal human speech and simply regurgitated previously established facts. I’ve had enough of that with the past few issues. Now, the fighting wasn’t particularly good, nor were the quips and banter therein. The structure of the battle on the page jumped around a lot, seemingly at random, and the core brawl between Wonder Woman and Darkseid was the only one that actually mattered. Jason and Grail’s faceoff didn’t really go anywhere, while Steve and his Howling Commandos appeared to be entirely ineffective. Like most of Robinson’s run, the battle was largely filler to get us from Point A to Point B without actually adding anything new or interesting to the story, revealing anything about the characters, or otherwise enhancing our reading experience. It was just a bunch of punches to burn through pages until Darkseid’s machine could be powered enough to open a portal to Themyscira. I do like a good fight. This is a superhero comic book, after all. But I like the fights to say something beyond “oh, this will fill up the issue until the dramatic reveal at the end.” This fight was entirely perfunctory. Any reader with any sense of how the story was unfolding would know that there were no stakes here at all. Darkseid’s plan was going to work, and no amount of brawling was going to change that. And about this dramatic reveal. So Grail gets to Themyscira and turns some Amazons into parademons. I have two big thoughts about this. First, those Amazons would have DESTROYED Grail. I know she’s half Darkseid or whatever, but Amazons are Amazons and there were a bunch of them. Even with a surprise attack, the gal would have been taken down and hastily so. You don’t mess with the Amazons. Second, this was framed as a homecoming for Grail after leaving the island years earlier, but here’s the thing: THIS IS NOT GRAIL’S PARADISE ISLAND. Remember when the New 52 relaunch messed up Wonder Woman and the Amazons so badly that DC brought in Greg Rucka and Nicola Scott to fix it? And that their solution was to explain that the New 52 Amazons were a fiction? Grail was created before this fix. She is a product of the fake Amazons, not the real Amazons. This Themyscira is not her home. Technically, her home doesn’t even exist and she is some sort of bizarre anomaly. The folks behind Wonder Woman don’t seem to care about any of this, and have decided to ignore the change in continuity entirely. Continuity needn’t be a prison, of course, but these things were changed for a reason. 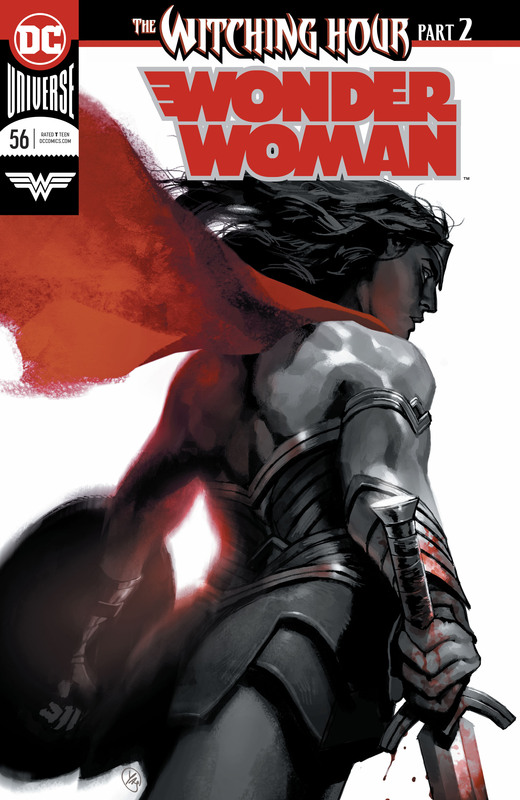 The Wonder Woman mythos was fundamentally broken, and Rucka and Scott set in right in a way that resonated with scores of fans. But now, this run is undoing all of that. Rucka and Scott danced around Wonder Woman’s New 52, daughter of Zeus origin, giving DC an out for ever mentioning it again. This arc has made it a centerpiece of the story. Rucka and Scott wiped away the New 52’s terrible depiction of the Amazons, and this arc has brought back one of its oddest, dumbest choices with Grail. It’s mind boggling. Everyone did a very good thing with Wonder Woman: Year One. It’s easily one of the best Wonder Woman stories ever told! And now DC is letting this trash fire of an arc toss it all aside. One bit of good news from this issue is that Emanuela Lupacchino is back. Even when she’s working on a tight schedule, which I suspect she may have been here, her art is always dynamic and enjoyable. She’s got a great grasp on Wonder Woman herself, and it was very fun to see her draw the Amazons, however briefly. It’s a shame that someone with such an obvious penchant for Wonder Woman and her world is being used for such a terrible storyline. I hope that she’ll get another shot at the book with a writer that actually understands and appreciates Diana. Romulo Fajardo Jr. remains on top of his game as well, like always. The richness of colour and the breadth of texture he brings to his work is just remarkable. It’s all so subtle and seamless, and remains the one thing keeping this entire run afloat. Luckily with Lupacchino he’s got some nice line work to enhance, but he’s definitely elevated several lesser artists in past issues and has maintained a consistent look for the title. So yeah, we’ve got Amazon parademons now and more fights ahead, I assume. Good grief. There’s a few more issues of this foolishness, and then Robinson is starting yet another storyline. When will the horrors end?! Not anytime soon, it seems. Ugh. I’m gonna run through the stupid contents of this issue real quick first! But then I’m going to tell you how rad Romulo Fajardo Jr.’s coloring is! So basically, Wonder Woman is still fighting Silver Swan, the most underdeveloped villain in the history of villains. Apparently there’s some sort of nanobot situation behind her transformation? Anyway, she’s evil and angry and spending most of her time rehashing literally everything we learned last issue, in typical Robinson fashion. Also, Darkseid and Grail are hanging out in the Amazon rain forest, and Darkseid sends the Female Furies after Steve Trevor and his knockoff Howling Commandos. Oh, and Jason tries to get into the fighting mix and uses some dumb wind power or something. Surprising no one, it proves ineffective. So yeah, it’s all very bad. Apart from the art! Before I get to the colorist, I should again praise the fine work of Emanuela Lupacchino and Ray McCarthy, who are making some horrible writing at least nice to look at. This week they’re joined by Carmen Carnero, who does some fine work as well. It’s a good looking book. You’d be better served to look at the pretty pictures and make up your own story and dialogue, really. The lovely art is, of course, brought to life by the marvelous coloring of Romulo Fajardo Jr. He’s been the only real constant on Wonder Woman since it’s “Rebirth” relaunch, and has been doing great work on the title for over a year and a half now. After sharing duties with Laura Martin, who colored Liam Sharp’s art, for the first year, he’s been the sole colorist since. It’s been a remarkable run for several reasons. First, by my count, he’s worked with over eleven different line art teams during that span. That’s a lot of change, and with each new artist he’s adapted his style to fit their artwork. Fajardo Jr. could have just colored them all exactly the same, but he doesn’t. When the art is more realistic, his colors are more subtle and textured to bring out the realism. When the art is more cartoonish, he goes a bit brighter and bolder and sells the style. There’s definite consistency throughout his work, too. The man’s blending in his shading, especially with skin tones, is impeccable, and the dude does amazing work with different textures. His ability to adapt to his artists while putting out high quality work is impressive, and it gives the series a cohesiveness that counters the constant upheaval of the line art changes. Second, it’s hard to be a colorist under the best of circumstances. If a script is late or the artist gets behind, the colorist is the last line of defense to ensure that the book comes out on time. This often involves working on crazy deadlines to pick up the slack for everyone else. It’s a thankless, high pressure job, and is doubly so on a bi-weekly series like Wonder Woman. The book is coming out every two weeks come hell or high water, and Romulo Fajardo Jr. is the person that has to carry the baton for the final stretch of the race with each and every issue. And he nails it! Every two weeks, we get a gorgeously colored comic book. No matter who’s writing or drawing it, the coloring is smooth and uniform and pulls the whole issue together. The linework is gorgeous, but he takes it to new heights. The smooth skin tones, the shine on the metal armor, the glow of the lasso, the texture in the stone, the grit on the girl trapped in the rubble. Everything pops. The man’s got an epic arsenal of skills at his disposal, and he uses them with aplomb. His attention to detail adds so much to the book. Romulo Fajardo Jr. has been a key part of Wonder Woman’s comic book adventures for years now, not just with Wonder Woman itself but dating back to Wonder Woman ’77 as well. His coloring really brought Lynda Carter to life in the early issues of that series, and it’s been exciting to follow his career since then. 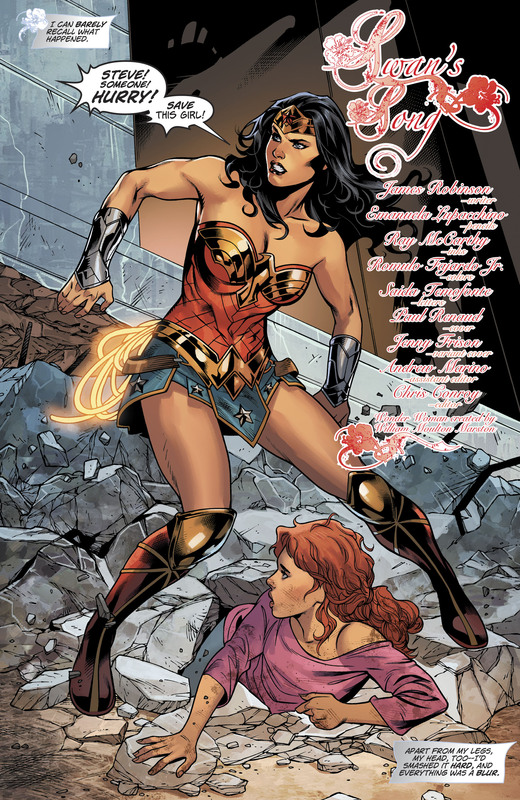 I’m glad he’s remained part of the Wonder Woman family, and it’s been so fun to see him color some of my favourite artists, including Mirka Andolfo, Bilquis Evely, Emanuela Lupacchino, and Nicola Scott. The man is going to go down in history for “Year One” alone; Scott killed it, obviously, but his colors paired with her linework beautifully, and that collection is going to be a classic for as long as comic books exist. So my thanks go out to Romulo Fajardo Jr., the MVP of Wonder Woman! I hope he gets to color her and her adventures for years to come!